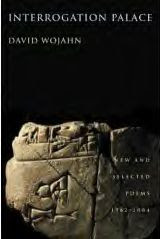 > I had the pleasure this afternoon of attending a reading by David Wojahn at Washington and Lee University. It was announced only last week that Wojahn was a finalist for the Pulitzer Prize for his Interrogation Palace, which he kindly signed for me today. The reading was not as well-attended as I had expected, but the room wasn’t empty either—all the people there I recognized were either W&L English Department faculty or spouses of faculty. had been screaming but now could sleep. I’m guessing there aren’t a lot of poems out there about afterbirth. I’m looking forward to diving into the collection. >Hmm. Enough for an anthology? I wasn’t aware of the Hughes poem but I suppose Wojahn was. I don’t see an echo of the Hughes line in Wojahn’s poem, though–that would have been interesting.